I try not to drink in the city but seem to find myself in Fix St James more than the rest of Sydney’s wine bars combined. There are some great sommeliers in Sydney and owner Stuart Knox with his signature red shoes is easily the most fun to be around. Fix is a bar and restaurant with some great food and a reputation for “natural” wines. Stu has become the go-to man for this style of minimal intervention wine, although I get the feeling that a large number of these wines hit his list simply because they taste interesting and exciting, rather than conforming to any particular philosophy. Most of the front of house team have been with Stu for a long time and share his passion for great “juice.” They ask what you are looking for and are able to recommend the perfect wine after just a couple of descriptors. There are a lot of wine events held at Fix during the year, the wine dinners are always great value. If you love interesting wines, great food and great service and are in the city, I’d recommend Fix St James. As small bars go, Yulli’s in Surry Hills is one of the most comfortable. It’s quite a surprise that a vegetarian restaurant has such a great line up of independent NSW beers but it’s great to see. They recently added an upstairs area which makes it much easier if you just want to sit and have a beer. In an interesting green initiative none of the products upstairs are bottled – there are 8 local draft beers along with draft NSW wine and local post mix soft drinks. It’s a great idea though I’m not too sure about the draft wine. Watch out as upstairs isn’t open every night which means that only four draft beers (along with lots of bottles) are available most weeknights and the more exciting (lower selling) beers don’t turnover as quickly as you would like. I’m not a vegetarian by a long shot but the food is also well worth searching out. This entry was posted in Australian Wine, Bars, Beer, Natural Wine, NSW Wine, Pubs, Real Ale, Restaurants, Sydney, Wine and tagged australian wine, bars, beer, new south wales wine, nsw, real ale, sydney, wine on February 24, 2013 by William Wilson. My road to wine started with a beer, quite a few of them actually. Guests constantly ask me how I became a sommelier. Perhaps they are surprised that a Scotsman would be so passionate about New South Welsh wine. I’m sure they expect me to talk about scotch and how to save money. They are usually surprised when I tell them my story. I started my career in hospitality in one of Edinburgh’s many specialist real ale pubs. Eight beer engines pumped out a constantly changing line up of guest beers. I took my job seriously, sampling every new beer as they went on line. The beers intrigued me, different styles and breweries from different regions with histories going back centuries. Most of all I was excited by the different aromas and flavours. I’d make tasting notes in order to explain the subtle differences between the beers to our customers. When I arrived in Australia the beer scene was bleak. Bland, over carbonated beer was everywhere and premium beer tasted exactly the same as regular but had a gold label on the bottle. Competitive advantage was gained by serving the same beer even colder than the hotel on the next corner. If I was to stay in Australia, I would have to find a new passion. My ‘Road to Damascus’ moment occured on the road to Broke, almost twenty years ago. My new employer organised a trip to the Hunter Valley. I’d visited breweries all over the world but Tyrrell’s was my first winery. Being able to stand in the vineyard and see grapes being picked and walk 20 yards into the winery to watch the winemakers at work was a revelation, so different from brewing. It was the people that really made me understane wine. Murray Tyrrell stood in front of us and told us why he wouldn’t sell out to the big boys despite the huge amounts of money that he had just been offered for the winery. 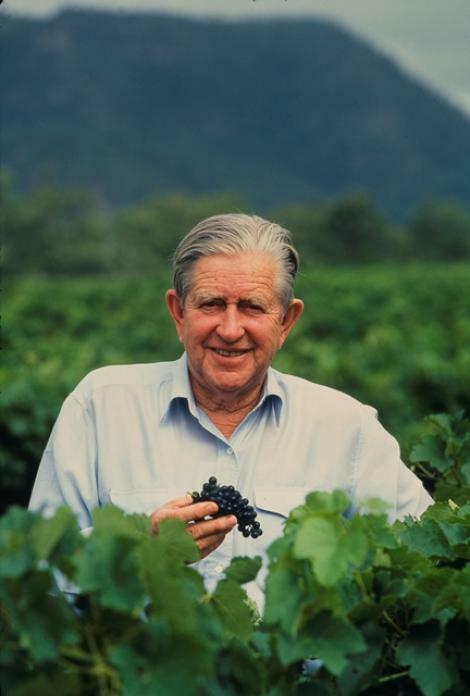 Perhaps Murray’s presence made the wines taste better that day; he did tell us that every wine we tasted was from the vintage of the century. I was hooked. Instead of choosing places to visit according to the number of breweries, wine regions were now top of my list. Friends questioned why I would go to Adelaide when they were heading to Bali. Visiting wineries and hearing stories from the people who made the wines became my education in wine. When winemakers talked of vintages spent in the Northern Hemisphere I would seek out those wines and see how they compared. Great Chardonnays and Pinot Noirs from the Yarra Valley and Tasmania were tasted beside whichever Burgundies I could afford. A trip to the Barossa uncovered some incredible wines. Chateau Tanunda was certainly lot more salubrious than the ironbark slab hut at Tyrrell’s. I tasted some of Grant Burge’s wines at Tanunda Cellars and again left with more wine than I could carry. A bottle of 1994 Meshach is all that remains of my early wine trips. More recently I’ve stuck to places closer to home. Winemakers from cooler climate regions of New South Wales are making some fantastic wines. In the Canberra District I discovered incredible Riesling at Lark Hill, great Shiraz all over the region and some of the best Pinot Noir that I have tasted at Lake George. I also discovered that Australia has lakes that don’t have any water in them. Philip Shaw in Orange was another inspirational visit. The cellar door is really the front room of his house and you are treated like real guests. The bloke who brings the wines over to you was the International Winemaker of the Year twice. I was even lucky enough to taste some of his wines from the barrel. His No. 11 Chardonnay and No. 8 Pinot Noir were my picks and his Idiot Shiraz is a bargain. When Fine Wine Partners brought over the Court of Master Sommeliers to test the skills and knowledge of Australia’s top wine staff, I really didn’t think I would know enough to pass. My wine list is very focussed on New South Wales and the Court exams are mainly about old world wines. Despite never really selling many wines from outside Australia, I managed to become one of the first Certified Sommeliers in the country, simply having listening to as many winemakers as possible over the last 20 years. Of course things have a habit of turning full circle. Over the last few years the number of interesting beers in Australia has skyrocketed. Wine lists in Australia are beginning to list a wide range of beers, not just the same beer with a different label but all sorts of different styles and matched up with different menu items. Beer is no longer just as a pre dinner drink and the best sommeliers know this. I always come across tiny craft breweries every time I visit a wine region these days. The craft brewing renaissance actually started in the Sonoma Valley in California. Perhaps the craft brewers know how much winemakers love a cleansing ale. Even winemakers like Lark Hill in Canberra and Moorilla in Tasmania are making beer. In fact they are making great beer. The beauty of both wine and beer is that my education will never end. There will always be new people to meet and learn from and to share my own knowledge with. I’m glad I found my new passion and never lost the old one. This entry was posted in Australian Wine, Beer, NSW Wine, Real Ale, Sydney, Wine, Writing and tagged australian wine, beer, court of master sommeliers, lark hill wines, new south wales wine, philip shaw wines, real ale, sommelier, sydney, tyrrells wines, wine on December 30, 2012 by William Wilson.